$2.5 million. Only 100 built! The Pagani is described by Car and Driver as, “Ludicrous in every way and utterly fascinating in every gorgeous detail, this is a 720-hp, mid-engined, million-dollar supercar for those who have grown bored with mere Ferraris and Lamborghinis and already have two Bugattis”. My husband tells me that this car can be temperamental but this description from Car and Driver really speaks to me. And, seeing the vehicle in person blew me away. I absolutely perceive a value proposition which is why I don’t feel it’s expensive. I will come back to the term value proposition in a moment because this concept holds the key to the differentiation between “expensive” and “I can’t afford it”. I guess if you are in a position to buy a $2.5 million car, these are all the benefits you need to sell. Have you ever had someone say to you, “I think your product/service is too expensive”? I have and It’s a dagger in my heart when I receive that feedback because I immediately know that I did not effectively convey the value proposition, that is, how the benefits derived from my product or service outweigh the cost. 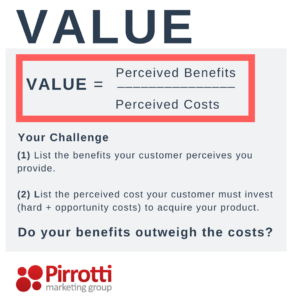 The Value Equation: Think of value as an equation where Value = Perceived Cost ÷ Perceived Benefits. Given this calculation, there is absolutely an opportunity to convey a value proposition regardless of price (hence the extreme Pagani example). Check out the description, “The most important model in Aston Martin history”. Now that’s a compelling compelling benefit. Think of your own buying experiences. You may not be in the market for a Pagani, so let’s start with an everyday item – organic fruit. I know that organic fruit is more expensive than non-organic. Still, I pay more money for organic fruit because I believe that the bundle of benefits I receive outweigh the cost. Is there an everyday item that you pay more for because you believe the benefits outweigh the cost? Creating and conveying value proposition isn’t as easy as it sounds. The challenge is found in the “perception” aspect of the equation. So, to create your value proposition, you must clearly understand the benefits that your prospect desires, and the hard and soft costs your prospect perceives that he/she may have to expend to receive those benefits. Once the perceived benefits outweigh the cost – you’ve succeeded! $20,000,000. Wow. Check out the benefits though. Do you perceive a value proposition? I have some tactics to help me develop a compelling value proposition. First I profile my target audience in terms of their needs and wants. Next, I create a list with two columns. The first column has the product / service features and the second column lists the benefits associated with those features. I dig down deep and create long list so that I have a lot of data to pull from when I am creating my messaging. I want to be able to listen to my prospect and then draw upon my benefits list as I respond to the prospect’s needs using my product or service to solve their problem. I use the same approach when I am crafting my ads, presenting the product or service in person, over the phone or via email. Tip #1: To gain a competitive advantage while building your value proposition, make sure that your benefits list is unique to your offering. You will not create value if your prospective customer feels he can get the same benefits at a lesser price from the folks next door. Tip #2: Never provide price first. Always list your product / service features and benefits first. Sell the dream. Your prospective customer should be salivating (a slight exaggeration – but run with it) over your product so that by the time he/she gets to your fair price – the purchase is a no brainer. The benefits description should not be long, it should be succinct, powerful and compelling. 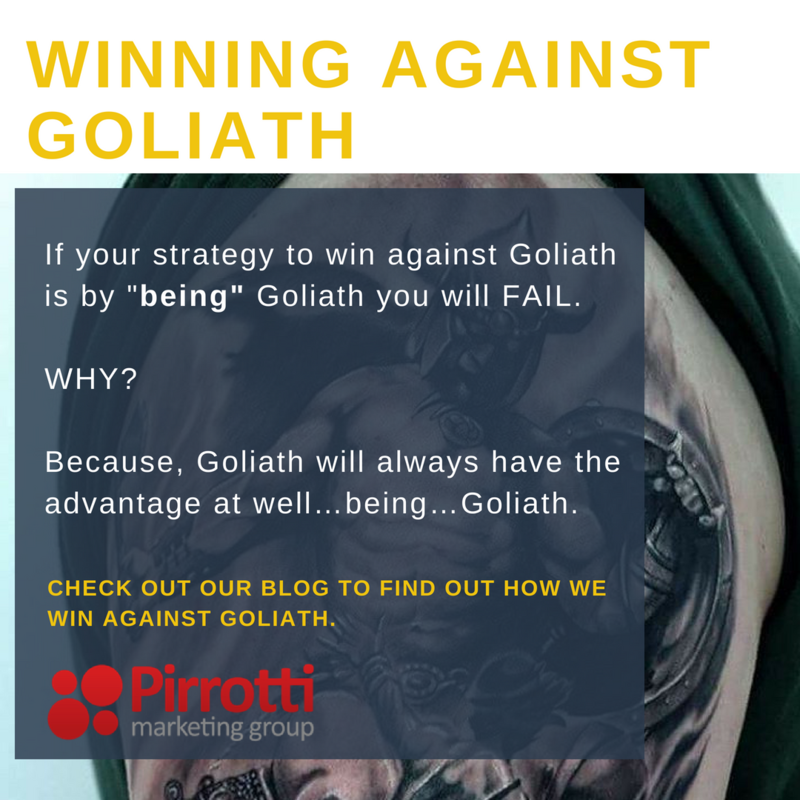 We build powerful value propositions and can create yours for your product and services. Photos taken at the Pebble Beach Consours d’Elegance 2017.